Welcome to the Homepage of the London UK Rangers Supporters club. Details of meeting etc will be posted here as and when they happen. If you want to be added to the mailing list the click on the link opposite and I will add you to the e:mail ditribution list. The above photo shows the Nine in a Row celebrations. Ten in a row is not to be. Celtic are the new Premier League Chanmpions. Rangers play Hearts in the Scottish Cup Final on the 16/05/98. This will be the last game in a Rangers Jersey for quite a few players and I'd just like to Thank them all for their efforts over the last Nine years. No Glory for Rangers or Walter Smith in his last year as Manager. Though there is no doubt that Smith has failed in Europe I will always remember him and his team for doing what I never thought possible and winning Nine in a Row. Over the course I think we only have ourselves to blame for this season and in the end threw it away to a poor Celtic side. I think next season will see our return to success and I see the signing of Numan as the start of a quiet revolution. I even fancy us to win the treble next year. NEWS: 04/06/98: The new league set-up have agreed a �45m Deal with SKY for 30 live games.The live games will have a 6.05pm, Sunday kick-off and will include three Old Firm meetings. Obviously this will mean more get togethers to watch Rangers once the new season starts so once a schedule is available I will post it here. 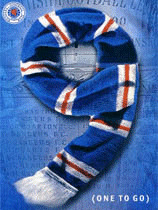 20/09/98 Rangers V Celtic Live on Sky. A Few of us will be in Glasgow for this one so check out the Horseshoe Bar. Mail me for the Location for Bears not able to travel to this game to watch in London.